For the longest time, I never knew this little trick. 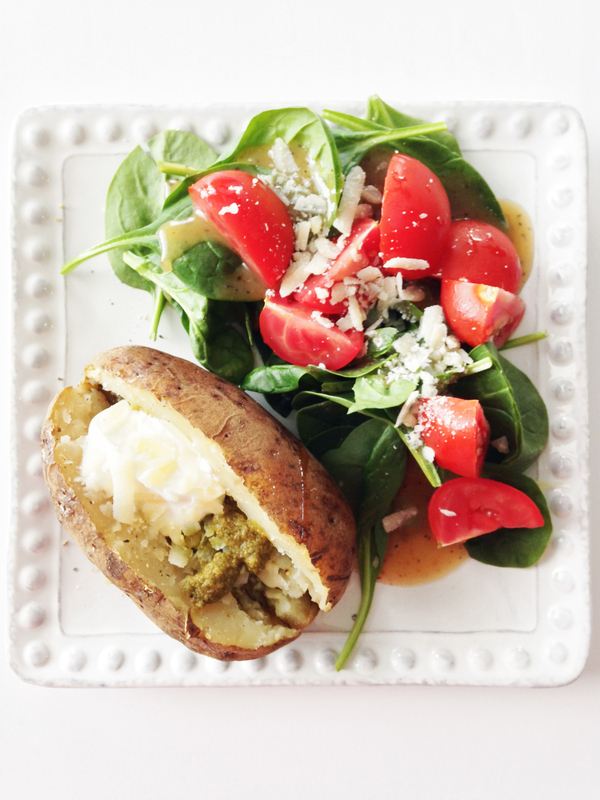 You can fake-bake your potatoes in a slow cooker, and it's so super easy that it's pretty ridiculous! I've been using this method for a while now, and it's definitely handy during the hotter spring/summer months when you don't want to boil the house up with turning your oven on. Plus, the potatoes can sit there and cook through the day leaving you not to h ave to worry with them at all. I cannot for the life of me remember where I first heard about this, and for whatever reason I wasn't entirely impressed with this trick the first time. I think it may have been because the insides of the potatoes do turn a darker or more yellow color as they take a longer time to cook. It's nothing off-putting. A few days ago I posted this lovely Steak on a Stick. You'll notice the lovely potato there in the background of the images. Well, after that... I wanted everyone to know what exactly and how it was that I made those potatoes because they are sheer heaven! Now, I topped mine with pesto and parmesan because that's what I was in the mood for. But, you could use the same crock pot method to make the potatoes and then tope them with whatever you want. Obviously. Now... on with the fake baking! Get a little stab-happy with your potatoes. Pierce them all over with a fork and wrap them in foil before tossing into the slow cooker. Secure the lid and set to cook on high for 4-6 hours or on low for 6-8 hours. By the way, you can totally cook more than two at a time. In this particular crock pot, I've done up to four and it worked out great! Once done, remove your potatoes from the slow cooker and allow to cool slightly before removing the foil. Score the potatoes down the middle and open carefully. At this point you could really top them with whatever you desire, but I was in a pesto and parmesan mood. Top each with 1/2 tbsp. butter, 1 tbsp. pesto, 1 tbsp. yogurt, 1 tbsp. parmesan, and the salt & pepper.